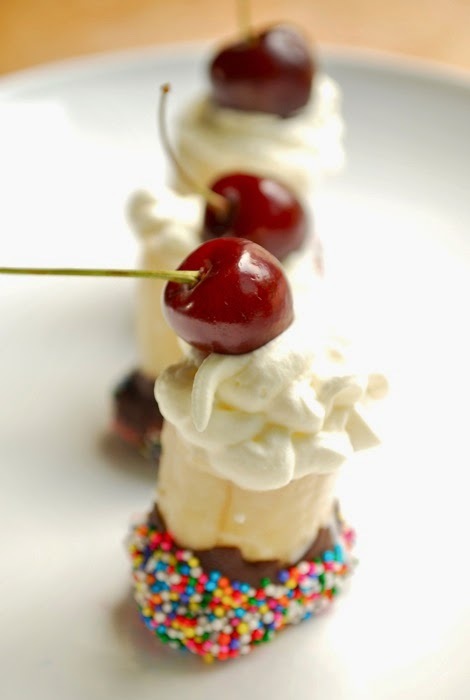 Yum - here is an easy & cool treat for a summer night - enjoy! These are THE yummiest treat I have maybe EVER tasted. So I wanted to share! They only take about 20 minutes (if you soften your cream cheese beforehand) to make and then an hour to chill in the fridge. Anyhow... here is the recipe. These are perfect to take or make for a party - they look & taste so gourmet. For Valentines, it would be darling to add a drizzle of red or pink chocolate on top... don't you think??! I spent 3 HOURS making sugar cookies last night! But...it was worth it - the dough tasting, the frosting sampling, and the fun with my 4 year old! So here is the recipe for YOU! I found this idea the other day and wanted to share it with you. I have seen the big sugar cookie pizza recipes that you cook on a pizza pan, but I like how these are miniature. Anything mini is just cute! Bake or buy your sugar cookies. Spread strawberry cream cheese on top. 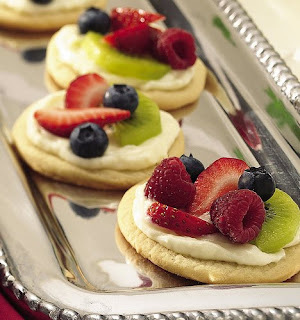 Slice strawberries, kiwi, grapes, etc., and decorate each cookie. Keep it simple. Arrange your mini fruit pizzas on a pretty platter and there you have it. Done. 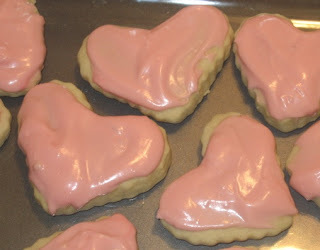 Here is a recipe I found on another site that has a variation of the cream cheese topping. It sounds good, too. Need a cute, easy, and YUMMY appetizer idea? You will need graham crackers, strawberries, cream cheese and chocolate. Break the graham cracker into two pieces and spread cream cheese evenly over the surface. Cut up strawberries and place them on top of the cream cheese and then drizzle chocolate on top of them. Serve chilled and enjoy! These would be fun to do for all you who are hosting or going to a party! Of course, you should come and grab some colored napkins from us to add a splash of color!